SAN FRANCISCO -- A 26-year-old man who allegedly led police on a chase last weekend through San Francisco and leapt from the upper to the lower deck of the Bay Bridge in an attempt to escape pleaded not guilty to nine felonies and three misdemeanors Friday. The charges against Randal Lee Maykopet Jr., which include assault on police officers and carjacking, stem from an incident that began at about 8:20 a.m. on Saturday. Police responded to reports of a man wielding a knife in San Francisco. But when the suspect saw an escape, he took it, stealing a patrol car and leading cops on an hour-long chase through the city and onto the Bay Bridge. Police responded to a report of a man armed with a knife near Chestnut and Lyon streets in San Francisco's Cow Hollow neighborhood. Officers tried to detain Maykopet but he allegedly ran and took off in a police SUV that still had keys in the ignition. Maykopet hit several civilian vehicles with the SUV while he apparently tried to evade police who were pursuing him through the city, according to police. Maykopet took eastbound Interstate Highway 80 to Treasure Island and again evaded police when they closed a gate in an effort to stop him, police said. Instead of stopping Maykopet drove onto the sidewalk, police said. Officers then fired at least one shot at the suspect but no one was injured, according to police. The suspect then drove onto the westbound ramp of I-80 where he hit yet another vehicle, police said. He then exited the SUV and jumped from the upper to the lower deck of the Bay Bridge, according to police. Once on the lower deck of the bridge, Maykopet allegedly tried to carjack a vehicle, but an officer arrested Maykopet after making the same jump, police said. Maykopet has been charged with two felony counts of assault on a police officer, one felony count of carjacking, one count of felony attempted carjacking, and two counts of felony evading an officer, prosecutors said. As a result of the incident, two officers, the suspect and one motorist went to a hospital for treatment of injuries that were not considered life-threatening, according to police. 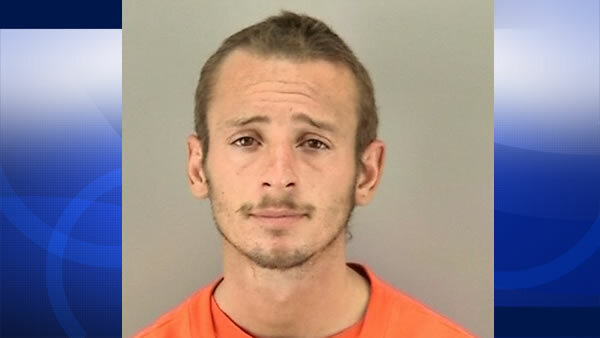 His preliminary hearing is set for Nov. 10 at the San Francisco Hall of Justice.